Traditionally speaking, museums have mostly been a place of solitary reflection. In the past few decades, with the rise of technology and the influence of social media, this aspect of museums seems to be rapidly changing. When we decide to visit a newly opened exhibition, we take the whole world with us on our journey. We tweet, check-in on Facebook, share our thoughts on countless platforms and have virtual conversations with fellow art-lovers. We are in a sense in two places at the same time: the physical reality and the virtual sphere, constantly shifting our attention back and forth, our smart devices acting as a portal that beams us up into the cloud and then brings us back to Earth the following second. For me, as an avid museumgoer, one of the most intriguing aspects is the fact that, while in some countries, AR has by now become an inherent part of any exhibition, there are still so many places where time seems to have frozen. It is an exciting prospect to see how and when those museums will fall in line with the current times and how they shall (re-)imagine the past using this technology. Augmented reality is definitely an innovative way to curate not just art, but all the histories of humanity preserved in cultural institutions. Its playfulness contributes to a multi-layered visitor experience, regardless of age, that enables a kind of familiarity with the viewed object or space, helping the visitor remember more and become more involved in its history. Manovich, Lev. “The Poetics of Augmented Space.” 5.2 (2006): 219–240. Web. Visual Communication. Rieland, Randy. 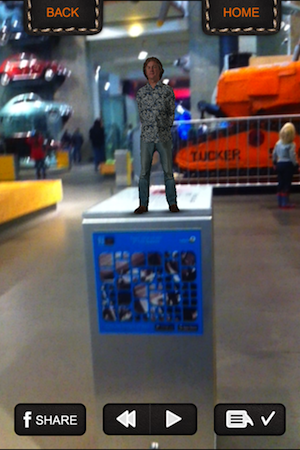 “Augmented Reality Livens up Museums.” Smithsonian. N.p., n.d. Web. 20 Nov. 2016. Schavemaker, Margriet et al. “Augmented Reality and the Museum Experience | Museumsandtheweb.com.” N.p., n.d. Web. 20 Nov. 2016. Brings to mind many fascinating possibilities. Technically there’s nothing stopping an exhibition from say: having an old steam engine on display, and using AR to overlay animations and graphics showing it working, complete with workers shoveling coal and gears turning. Once wearable technology advances more into the AR space (see Microsoft HoloLens). Great article. There are definitely infinite possibilities of what we can do using both AR and VR in all aspects of human life, not just the museum space. But with it come many challenges that must still be overcome, like the fact that many still reject the idea that such technologies might tamper with the sober aura of museums and libraries. However, new technological advances have opened up an exciting new world that we must learn to implement in both cultural and educational institutions.